Sailing On Ice? Yeah, That's A Sport. Imagine racing over a frozen lake on a wind-powered sled, hitting speeds that top 40 miles an hour. That's what ice sailors all around the world do just about anywhere water freezes. 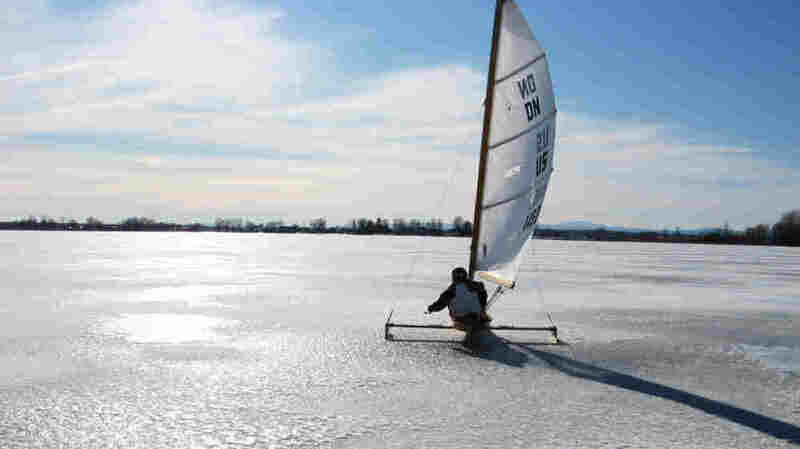 In the U.S., Lake Champlain has emerged as one of the country's best ice sailing venues. We meet at Chazy Landing on the New York side of Lake Champlain, 12 miles from the Canadian border. It's bright and windy. The ice stretches for miles, dotted by camps of shanties set up by ice fisherman. I'm bundled up in four layers of winter clothing. Sajor hands me a crash helmet and ski goggles. "I noticed on our way up here that there was a new plate [of ice] that formed last night," he tells me. "It's gonna be gorgeous if we don't get any snow on it and it stays cold like this." 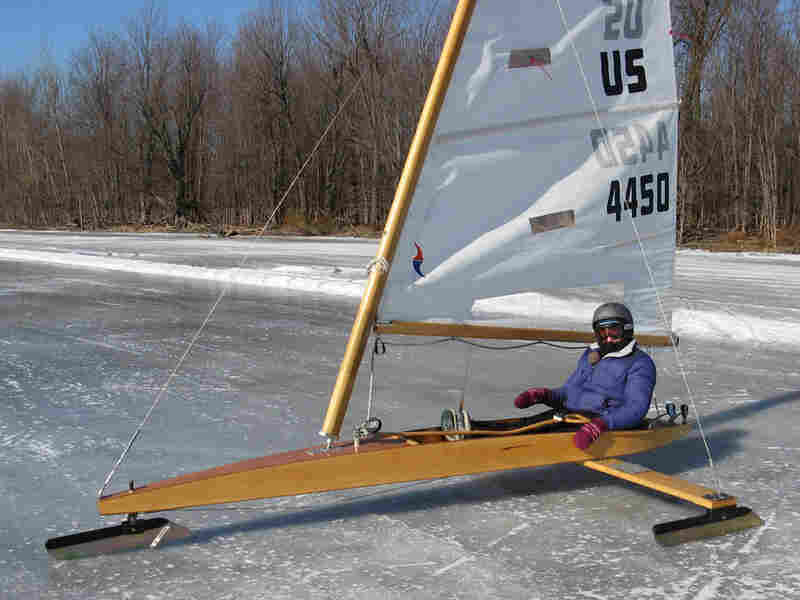 For her ride around the lake, reporter Sarah Harris claimed the ice boat's only seat while Sajor balanced the plank next to her. Together, they reached a top speed of about 48 miles an hour. Now that I'm out on the ice, and not watching YouTube videos, I get a little nervous. Sajor says he isn't sure how fast we'll go, but he's brought a GPS so we can find out. "With enough wind, we'll probably get up on one runner decently and you'll get to feel a little bit of the harum-scarum," he says. We climb into Sajor's 12-foot-long DN, ice boat. It's T-shaped with a long, horizontal plank at the back. There are two runners on either end of the plank and a runner at the bow that allow the boat to skim across the ice. While I sit in the boat, Sajor perches above the runner, demonstrating a ridiculously good sense of balance. Then he takes the biggest risk of the day and asks me to steer. "When we're steering the boat, if we want to go to the right that means the tiller which you're holding goes to the left," he says. The boat starts moving, then we catch a breeze and it accelerates — a lot. We fly across the lake, runners rumbling. Eventually, we make it back to the landing without hitting anything or tipping over. My fingers are so cold I can't feel them, and I'm a still shaking a little from the speed and the rattle of the ice against the runners. Sajor checks his GPS — our top speed was about 48 miles an hour. "We were only out there for an hour and we did a little over 10 miles," he says. As we pack up, I suddenly understand why ice sailors like Andy Sajor are so devoted to this sport. It's exhilarating, zooming across a plane of frozen water like that. All that's overhead is the sky; all that's driving you is wind and sail.